Jesus isn't known as the Great Physician for no reason. The word “salvation” has its roots in the Latin word for health, “salus, salutis.” Our spiritual health is our salvation in Christ. To get well implies that one was sick. The well don't get well, only the sick can get well. Lent is a season of sacrifice to be sure, but it is also a season for diagnosis—to dia is to “split apart” and gnosis is knowledge, so to diagnose is to split apart knowledge, or dissect what you know in order to learn more. The exploration of your interior life with God is what the Church's Lenten exercises are all about. Think of fasting, prayer, alms giving, and charitable works as diagnostic tools for figuring out what's wrong with you spiritually. Difficulty fasting? Perhaps you are inordinately attached to food, drink, TV, smoking, etc. Having trouble with prayer? Maybe you are experiencing a profound lack of humility, a reluctance to submit to your total dependence on God. Alms giving causing you problems? Looks like trusting in the Lord's loving providence may be at the root of the problem rather than simple greed. Not open to doing charitable works? Could be that you are less than pleased to receive the charity of others, or perhaps you are making an idol of independence. Jesus says that he calls sinners—the sick—to righteous—good spiritual health. Those among us who live and breath righteousness have no need of a cure. The rest of us are in need of a good physician. Fortunately, we all participate in the Divine HMO of the Church. No exclusion for pre-existing conditions. No co-pays. And all the nurses are angels! Dali Lama thrown out of the White House with the daily garbage? Stay classy, B.O.! Despite the fact the suicide bomber in Austin, TX was a publicly professed socialist and anti-Catholic bigot, the lefty MSM strains at portraying him as a right-wing zealot with connections to the Tea Party. Clueless, anyone? Sitting next to fat people on a plane. . .for the record, I never need a seat extender and I can sit with the arm rest down. Deadwood university faculty: what to do? The Supreme Court ruled mandatory retirement for tenured faculty unconstitutional back in the late '90's. This is a big part of the problem for new PhD's in the job search. The Unwashed Masses of Fly-over Country vs. Our Cultural Betters: why we aren't buying the faux populism of those who think themselves our superiors. On the use of nominalism in the war against terror. . .what's in a name? What role does religion play in propping up a fascistic state? "Using every licit means. . ." Franciscan friars skateboarding for Jesus! The teens in the rehab program of the psych hospital I worked for were rarely happy to find themselves locked up. State regs required that all new patients be strip-searched for contraband and weapons. We weren't treating rich kids from the city's gated communities. Our male patients were mostly violent gang members, or gang-wannabes. When it came time for a new guy to go through the search, he usually balked and became very, very agitated. Inevitably, I found myself giving him a rather stark choice: “You can choose to do this the easy way or the hard way.” The hard way involved four or five 250 lbs staff taking him to the floor and putting him in restraints. In the four and a half years I worked on the unit, Staff never failed to carry out the required search. We can take easy way or the hard way in practicing our faith. Unlike my stubborn patients, we are encouraged to choose the hard way. Isaiah reports that the Lord is not really all that interested in our ashes and sackcloth and weeping. You can be a brutal slave driver and still manage the charade of public penance at the end of the day: “Do you call this a fast, a day acceptable to the Lord?” Unfortunately, we sometimes do. So, what is the fasting that the Lord wishes from us? Setting free captives unjustly bound; feeding the hungry, giving food and shelter to the homeless; in other words, a fast of charitable service to those who need to see and hear and feel the love of God. Why is this the hard way? There are no 250 lbs staff members waiting to pounce and force us to be servants. There are no restraints involuntarily placed on our charity. We are as free to be as miserly or as generous as we choose. The real choice here is between being the master with an enslaved heart, or a slave with a heart truly freed. Technology and the Orwellian Age: high school uses student laptops for spying! Finally. Heads are starting to roll over the U.N. "Climate Change" boondoggle. NB. This guy is a social worker NOT a scientist. Dominican friar appointed archbishop of Prague. Number of exorcisms on the rise in Poland. Most likely to attend Church: Mississippians. Least likely Vermontians. The art of hiding. . .there may be one crawling on you right NOW!!! Optical illusions: these things drive me crazy. During Lent, tape this pic on your 'fridge with the caption, "I'm watching you!" Few of us will be offered the chance to forfeit ourselves in exchange for gaining the whole world. That would be a temptation worth thinking about twice! Unfortunately, most of us are seriously tempted by far less than the acquisition of global power and wealth. The Devil knows us well. . .too well. He knows that trying to sell us on a deal of Having It All in exchange for our allegiance would raise suspicions. Too big. Too complex. Not a workable temptation. Instead, he offers us smaller, more manageable lures to catch us out. Once we've taken the bait, it's just a matter of waiting for the hook to dig in deeper. He gives us some slack. Lets us run a while. And then, just when we think our deal with the Devil has been just a little harmless fun, he snaps the line and reels us in. Jesus says that we must deny ourselves daily, take up our cross daily, follow him daily. Persistence, vigilance, fortitude. The happiest fish is the fish that stays clear of fishermen fishing with pretty hooks. SSM proponents in CA misunderstanding religious opposition to their agenda. . .they seem to think that religious folks oppose SSM for no other reason than that radically redefining marriage will encroach on the free exercise of religion. It doesn't occur to them that opposition to SSM might be based on something more than raw politics. A Rome-leaning Anglican bishop is talking directly with the CDF about the Holy Father's initiative to welcome alienated Anglicans into the Church. Why direct talks with Rome rather than talking to the bishops' conference of England & Wales? Look like the English and Welsh bishops aren't all that interested in seeing the Pope's plan implemented. E.U. Nanny State begins a bloodless coup in Greece. . .bureaucrats as revolutionaries? Strange but necessary: AZ proposes law to bar judges from using foreign/religious law in making legal decisions in an American court. Report on the Holy Father's Ash Wednesday service at O.P. headquarters, Santa Sabina. NB. for those who insist that all Real Catholics wear their ashes all day. . .the Roman custom (cf. pic) is to receive the ashes sprinkled on the head rather than smeared on the forehead. 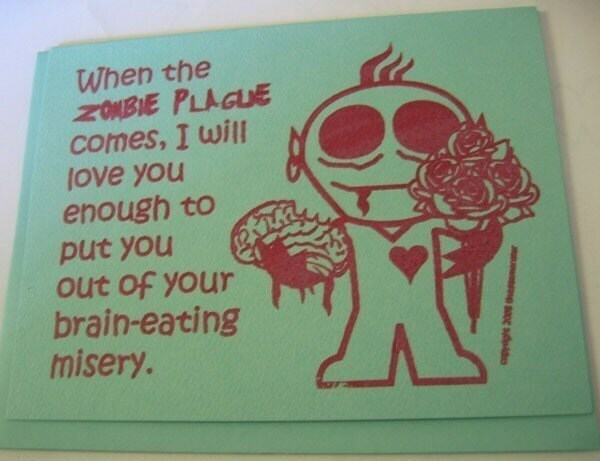 Aaaahhhhh. . .true Zombie love. The American Psychological Association is revising its diagnostic manual. They need to include ambulothanatophobia in the revision. Just sayin'. Oddly disturbing animal pics. . .the Gatorfrog? G.I. Cow? I'm going to make an effort this Lent to post a short, daily reflection on the Mass readings. I've tried this before and failed rather miserably. Try, try again, right? The Book Depository Wish List experiment continues. . .
Four of the seven original books on the list have been sent my way! I rec'd another surprise recently. Please, remember to let me know via the combox here if you decide to make a purchase from this list. B.D. doesn't delete a book from the list when it is purchased, so there's the risk of duplicate purchases. We begin the Lenten season of 2010 with this declaration: “Behold, now is a very acceptable time; behold, now is the day of salvation.” An admonishment from Paul against receiving God's grace in vain, the Church in Corinth back then and the Church gathered here right now are urged to remember that our salvation through Christ is not only a subject for ancient history and a concern for the distant future but also a decision to be made NOW. Paul, an ambassador for Christ, writes, “We implore you on behalf of Christ, be reconciled to God.” To choose reconciliation with the Father through His Son is the supreme act of humility, the recognition that we are completely dependent on His love for us—for our creation from ash, our re-creation out of an emptied tomb, and for our final rest in His kingdom. We receive the ashes of Lent this morning to celebrate our dependency, to mark our mortality. And, most importantly, to show ourselves as pilgrims on the way to Easter morning. To help us arrive properly prepared in Jerusalem on Easter morning, forty days of the Church year are set aside so that we might be summoned daily to the work of repentance. And so that we do not fall into the trap of believing that the work of repentance is merely a matter for the intellect alone but the work of the body as well, we are called upon to fast, to pray, to give alms, to do the good work of Christ among his people. Mind, heart, hands—all that we are must be reconciled. To his disciples, Jesus lays down a challenge: resist the temptation to play at being repentant; reject the performance art of public repentance; do not follow the hypocrites in drawing attention to yourself for the sake of pious praise. Instead, truly repent; receive God's forgiveness in secret; go out into the world clean, smiling, joyful. Wash your face, anoint your head, and receive all the Lord has to give you. This Ash Wednesday. . .declare war! Fr. Z. (always a good read!) offers the indispensable service of translating the Latin prayers of the Church into English. may be fortified by the support of continence. Martial imagery in prayer, long out of fashion in the post-VC2 Church, has its appeal for those of us who must do more than merely struggle with temptation. May today mark a declaration of war on the Arch-Terrorist. Since we are reading Mark's gospel this morning, it shouldn't surprise us that the disciples are dumbfounded by this rather enigmatic warning. It seems like Jesus spends most of his time in Mark's gospel thumping the thick skulls of the poor disciples! This time, when they misunderstand his warning, he scolds them, “Do you not yet understand or comprehend? Are your hearts hardened?” What have our slow-learning brothers missed? What truth has dashed itself against their rock-hard hearts? First, they have forgotten that Jesus identifies the “leaven of the Pharisees” as the sin of hypocrisy—the public pretense of holiness that hides spiritual corruption (Luke 12.1). Second, they have failed to understand completely the significance of the miracle of the fishes and the loaves. Like a stern school master, Jesus rehearses the correct answers with them. Alright boys, how many loaves were leftover when the crowds had finished eating the bread I provided for them? Seven and twelve, they respond. Now, do you understand, he asks? The leaven of the Pharisees is hypocrisy—a show, a piece of playacting to please an audience. In fact, the first hypocrites were Greek actors who used elaborate masks and tricks with the voice to portray different characters in a play. They followed a script; choreographed their movements; and wildly exaggerated their emotions all to stimulate their fans. For the Pharisees, the husband to desire and the father of sin is pretending to be holy, pretending to be righteous, and all for show. Their desire to actually be holy is leavened, raised up and given life, as a parody of real holiness: white-washed tombs, clean on the outside, rotting on the inside. Jesus compares their showy pretense at righteousness with his own miraculous leavening for the benefit of nine thousand people on two occasions: real bread to feed the hungry with baskets-full leftover. The Pharisees put on a nice act; Jesus delivers the real deal. If we are to marry the desire for righteousness and conceive the Word, we too must be wary of the leaven of the Pharisees, remembering who it is that gives us life. James writes, “[God] willed to give us birth by the word of truth that we may be a kind of firstfruits of his creatures.” We ourselves are made by the Word of Truth, reborn in this Truth, and, if we choose to leaven our desires with true holiness, we will conceive and give birth to His Word made flesh, Christ Jesus. Catholics are rarely accused of practicing an efficient or simplified faith. Two thousand years of accumulated philosophical and theological thinking woven together in the public celebration of the sacraments plus centuries of involvement in secular politics and international missionary efforts have bequeathed to the 21st century Church a vast global corporation with roots deeply embedded in human history. Thus, the practice of the Catholic faith is anything but culturally rigid and historically frozen. Sure, doctrinally, we share a single faith. But how that single faith gets lived on a daily basis around the world is hardly a matter of lock-step spiritual regimentation. Such orderliness and consistency would require the Church to “bottom-line” the faith, to boil it down, reduce it to a catch-phrase or a mission statement. And even then there would still be incredible variety in actual practice. But let's say we were going to take on the challenge of encapsulating the complexity of the faith into a single teaching, just one proposition that Really Mattered above all others. What would we come up with? I'm not sure we could do better than Paul does in his letter to the Corinthians: “If the dead are not raised, neither has Christ been raised, and if Christ has not been raised, your faith is vain; you are still in your sins. Then those who have fallen asleep in Christ have perished.” What would make our faith a vanity, a frivolity? That Christ never rose from the dead. Without the resurrection, we are still held captive by sin, perishing even as we breath. Let's focus for a moment on the question of what it is that makes an act, or a belief, or a habit vain. First, we have to think beyond the typical use of the word “vain.” Cocky, conceited, or narcissistic. But why do we use “vain” to describe someone who is full of themselves? This brings us to the second, less common use of the word. Frivolous, hollow, futile. Someone who builds a life on looks, smarts, wealth and then lauds these qualities as valuable in themselves can be described a vain because they have inflated what is in realty a temporary condition into an illusion of something permanent. Since looks fade, smarts can be deceived, and wealth lost, it is vanity—futility, foolishness, emptiness—to count oneself worthy based on nothing more than that which can be destroyed. “How long will you be dull of heart? Why do you love vanity, and seek after lying?” (Ps 4.3). Loving trivially while you live is a curse. Loving the trivial at death is damnation. Paul writes that our faith would be a vanity if Christ had not been raised from the dead. We would be foolish to put our trust in God if the promised resurrection had not occurred. We would be living lives emptied of eternal purpose, living our short lives as little more than exceptionally smart animals destined to ashes and then. . .nothing. If this were true, then our suffering while we live is the greatest vanity of all. The French philosopher, Albert Camus, once said that the only significant philosophical question is: why not commit suicide? Why suffer if there is nothing more for us than suffering? Perhaps our only chance to be courageous is to end it all now. Fear of pain or the unknown may cause us to hesitate, but overcoming this hesitation would be an act of freedom, pure liberated choice. Gun to the head, I choose to suffer no longer. POW! And then I am free. But can a bullet to the head truly free me from the futility of suffering? No. Assuming the impossibility of an afterlife, suicide can foreclose the possibility of any future suffering. But it does nothing to redeem the suffering I have experienced in the past nor the suffering I have caused to others. Death is not a new life. It's just the end of this one. Without the resurrection, death itself proves to be a vanity. So, what does the resurrection add to the mix that changes the futility of death into the blessing of eternal life? The hope, the promise of life beyond life, another way of living that draws us—especially in our suffering—into a superlative renewal. Paul writes that if the resurrection had not occurred, then those who have died have truly perished and “if for this life only we have hoped in Christ, we are the most pitiable people of all.” We are indeed worthy of pity if we have hoped in Christ only to die into a permanent death. Think for a moment. How would we suffer if we knew that suffering was all we had to live for? We would mourn, hunger, weep; endure persecution, insult, torture; live in poverty and desperation; practice forgiveness and mercy all the while knowing that we would never been shown either. Where is the beauty of suffering if suffering is all we can hope for? Why mourn the dead if death is a release from pain? Why weep in hunger if hunger will bring us to an end? Why endure insult and persecution if those who would torture us are right about the vanity of our hope? Without the resurrection, there is no good reason for us to do anything but seek after our own pleasure while we can, regardless of the costs and knowing even as we celebrate that the party will end. Christ's resurrection, and our hope in following after him, turns the curse of inevitable suffering into the blessing of eternal life. The ugliness and disease of sin is redeemed into the beauty of godly perfection. Rather than curse those who mourn, weep, endure insult, hunger and thirst, we bless them, knowing that everything persevered here and now is also redeemed here and now, made new, wholly and utterly transformed into acts of praise and thanksgiving here and now. After death, our suffering is made perfect in the sufferings of Christ, but here and now, while we endure, we are blessed with the hope of that perfection. If we will, we can call the state of suffering with hope, Beatitude—the beautiful life lived in Christ. Jeremiah prophesies, “Blessed is the one who trusts in the Lord, whose hope is the Lord. He is like a tree planted beside the waters that stretches out its roots to the stream. . .” And as we stretch our thirsty roots, seeking out the waters of eternal life, the hope we share in Christ sings just one refrain over and over again: there is nothing we should fear. Nothing. The beauty of hope does more than oppose fear, it conquers fear. And that victory was won long ago. The rock of the tomb was pushed aside and the grave was found empty. Our perishing—though painful—is redeemed. And our beautiful lives in Christ, here and now, are blessed beyond measure.